Fan Film Factor – Exploring the world of Star Trek fan films. 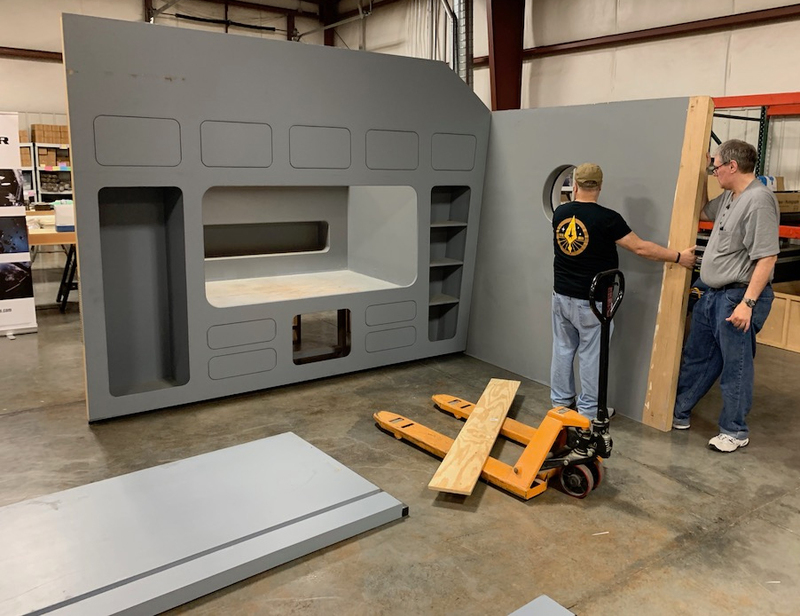 WARP 66 STUDIOS expands its TOS sets…with the help of JOSH IRWIN from Avalon! Okay, on to WARP 66 Studios. 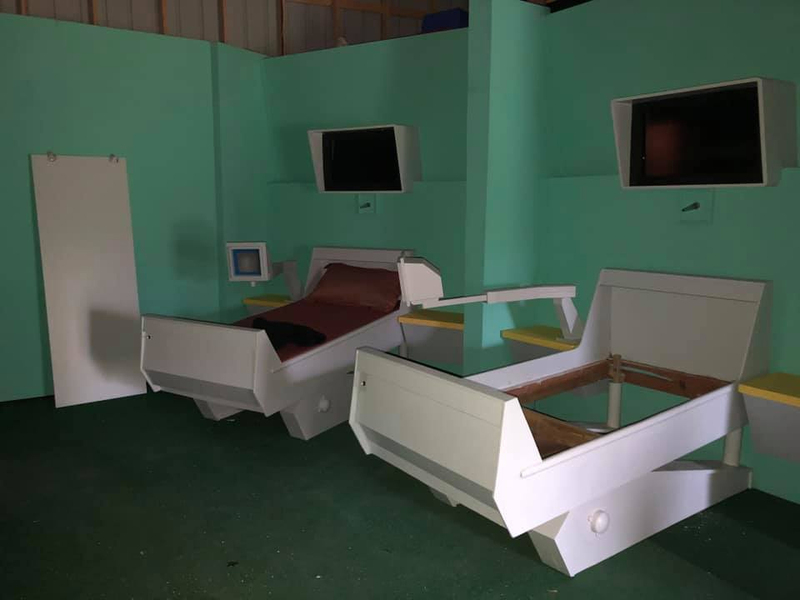 Named after its founders GLEN WOLF and DAN REYNOLDS (Wolf And Reynolds Productions) followed by the year of the premiere of Star Trek (1966), their TOS sets are located in northern Arkansas on property owned by Dan and other property owned by Glen. Already, they and their team have constructed a partial Constitution-class bridge and the cockpit of a shuttlecraft, both of which were used in the recent fan films THE FEDERATION FILES: “Galaxy Hopper” and and AVALON LOST. Currently, the sets are for The Federation Files and friends of the production group. Basically, if a member of our crew whats to make his/her own film, they may use our sets. 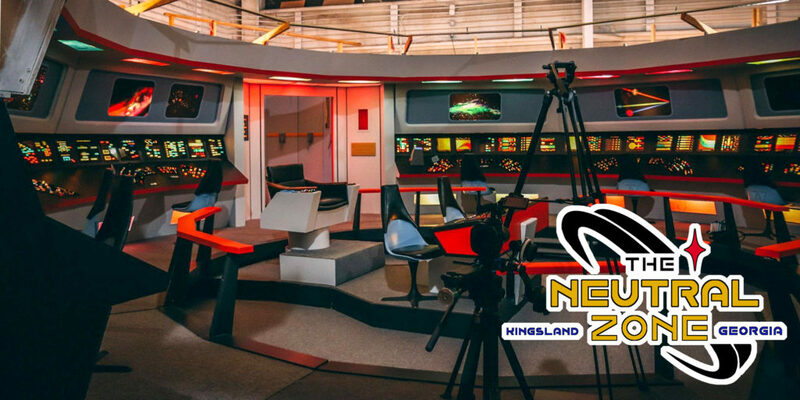 We are in no way “competition” for The Neutral Zone or James Cawley’s Fan Film Academy. We are building sets for specific shoots, all of them can be considered temporary aside from the bridge.People may contact me, but due to the fluid nature of the sets, I can not promise any particular piece would be available. It’s honestly a dream come true to spend the day building a space ship to film on. 14-year-old me would be very jealous of what 38-year-old me did today. Author Jonathan LanePosted on April 15, 2019 April 15, 2019 Categories Crowd-Funding Blogs, Fan Film Features, NewsTags Dan Reynolds, Glen L. Wolfe, Joshua Irwin, The Avalon Universe, The Federation Files, WARP 66 Studios17 Comments on WARP 66 STUDIOS expands its TOS sets…with the help of JOSH IRWIN from Avalon! SPOILERS ARE JUST MY WAY OF SHOWING LOVE! At first, I was thinking of titling this blog “The Big Good-bye” or “The Long Good-bye” or “We Get It Already—Everybody Is Saying Good-bye!” I also considered, “That’s Not Orange, Dammit; It’s Red!” But in the end, I didn’t want to sound harsh because it implies that I didn’t think this was a good episode. The penultimate 13th episode of STAR TREK: DISCOVERY‘s second season, “Sweet Sorrow,” wasn’t a bad episode…far and away not! 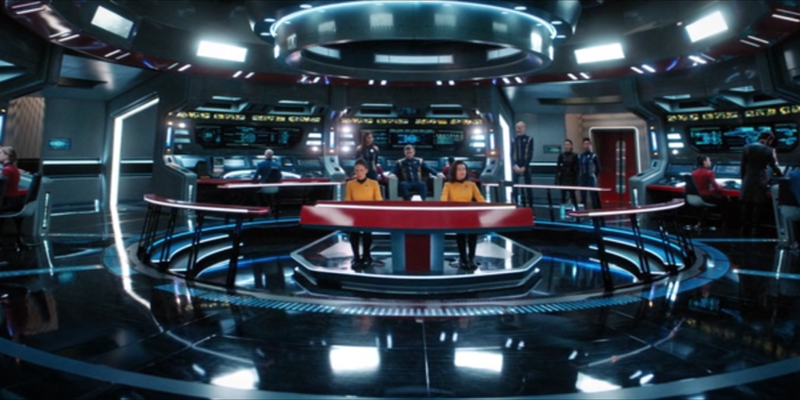 It finally showed us a redesigned bridge of the USS Enterprise NCC-1701 that didn’t feel like an Apple Store. In fact, I wanted to grab a Klingon time crystal, take this bridge back to 2007, kidnap J.J. Abrams, and shout: “THIS!!! !” In fact—looking at the uniforms, the handles in the Enterprise turbolift, the sounds of the bridge and the photon torpedoes, etc.—it might not be a bad idea to take a time detour to 2016, kidnap Bryan Fuller and whoever was the original production designer on Discovery, and shout, “THIS!!! !” even louder. So yes, I liked the Enterprise and the people in it. And I just signed the Change.org petition to CBS trying to convince them to do a new CAPTAIN PIKE series on the Enterprise in pre-TOS. Serious no-brainer, CBS: don’t let Anson Mount get away!!! But this episode also suffered from a number of weaknesses…many of them stemming from the fact that the season was originally set to be 13 episodes and, early on, a decision was made to stretch the finale into two parts. And there’s no doubt that the last episode will be an amazing, budget-blowing WOW!-fest. And about half of this episode was equally stunning. But there was also a lot—a LOT!—of filler. And ultimately, this episode felt (to me, at least), like being the passenger with a student driver who is constantly accelerating and then hitting the brakes hard and then repeating the process. See what I did there? There’s the Enterprise bridge and then there’s the bridge to transport the crew over to the Enterprise…aw, just appreciate the brilliant pun and move on! Okay, let’s give credit where credit it’s due. The first 12 minutes (longest Trek teaser ever????) was VERY watchable and, in certain places, just a bit of a Trekkie-gasm for long-suffering fans who have been screaming “THIS ISN’T OUR STAR TREK!!! !” for the last two years. Granted, for those wanting to see an exact replica of the the Desilu sets from 1965, there will never be acceptance. And there were other minor issues like the red alert animations being from the Trek movie era. And of course, that’s NOT the USS Enterprise NCC-1701 that we all grew up dreaming about one day traveling on to the stars. And the mammoth size of the Discovery next to her just brings home that, visually, this is a VERY different “prime” universe. But then again, there’s the familiar TOS theme music played multiple times—and who doesn’t like that?—along with the whooshing doors, bosun’s whistle when Pike enters the bridge, and the familiar sound of the photon torpedoes firing….like coming home! And those space maneuvers by Detmer were cool…as were those unfolding walkways (Discovery is a veritable Swiss army knife!). And of course, we get to see Number One again (this is only the second time this second that Rebecca Romijn has appeared—I feel like we were promised Number One and ended up only getting Number One-Half). And did you notice in the closing credits they list Yeoman Colt as appearing in the episode. I’m not sure which bridge officer she was, but Nicole Dickinson has been a ST: Discovery stunt woman and extra (she’s played Klingons and was the female Talosian, by the way). And for those who didn’t memorize useless trivia for a hobby as a kid, Yeoman Colt was the red-haired crew woman who beamed down with Number One into Pike’s “Cage” on Talos IV in the first pilot episode of Star Trek. While the first 12 minutes were fun, Burnham’s log goes on for a nearly uninterrupted THREE MINUTES!!! The reason, of course, is that we’re wrapping up a dozen episodes of a complex, season-long story-arc with many moving parts. Just in case anyone missed something, has ADHD like Tilly, or simply decided to start watching at episode 13 of the second season, here’s the story so far…for three frickin’ minutes! And yes, class, this will all be on Friday’s test. I usually read a few different reviews before I write mine. Sometimes I’m looking for inspiration. Other times I’m trying to confirm that it’s not just me who noticed this or was bothered by that, etc. Most times, though, it’s just because I want to make sure I’m not just writing the same thing everyone else is writing. When Michael was left alone with the time crystal, of course she was going to touch it and get a glimpse into a horrible future because we have to know that what’s coming is bad so that we can be invested in avoiding it. There was such a HUGE build-up to the self-destruction of the Discovery, so of course it wasn’t going to happen! And naturally, it was going to be due to the Sphere archive protecting itself. After all, Discovery needs to be around in 1,000 years for “Calyspo” AND we saw in the coming attractions from last week’s episode that Discovery is still around when the Section 31 ships arrive. Fans have been predicting that the Red Angel is Michael Burnham since the beginning of the season. Granted, I thought it was the future Discovery, so I was wrong. But once I knew that Burnham’s mom (who shares most of Michael’s DNA) “fit the suit,” it was inevitable that Michael would don the suit. So no surprises there, either. C’mon, ya just knew this was gonna turn into a one-way trip for the wearer of the suit! And what’s more, the fact that Discovery‘s spore drive would be inoperable for 12 hours (or however long it took to make sure they couldn’t jump away from the “big payoff” battle in the season finale) was also inevitable. That’s the problem with giving your starship a “superpower”—you sometimes have to find a way to neutralize the superpower or risk eliminating all the drama and suspense. THE WRITERS DON’T UNDERSTAND THE SIZE OF SPACE! I realize that Control is like Skynet and Leland like the Terminator—they just keep coming at you and won’t ever stop or give up. Fine. But Discovery has the Magic Mushroom drive and can go anywhere in known space. “Oops…here comes Section 31! Hey, let’s jump 25,000 light-years in that direction!” Then, 25 years later, here comes those Section 31 ships again. “I have you now,” says Control/Leland (Conland? Letrol? ), as the 30 ships power up weapons. So Discovery simply jumps back to where they started. “Oh, crap…not again!” says Control. Lather, rinse, repeat. Sometimes I think sci-fi writers on this show really have no idea how big space really is. I mean , you may think it’s a long way down the road to the chemist’s, but that’s just peanuts to space! So Discovery really could force Control to spend months or even years catching up with them, and then do it all again and again. And if the crew can’t figure out a way to power up that time crystal in all that…um…time, then they really need to find another sci-fi series to star in. And speaking of space and time, apparently Vulcans have TARDIS technology or their own spore drive because Sarek and Amanda somehow manage to get from their Vulcan beach house to a spaceport and over to Discovery in record time! And remember, while they’re flying toward Discovery, Discovery jumps to Xahea. And somehow Sarek and Amanda get to Discovery BEFORE the Enterprise does at maximum warp??? C’mon, writers…THINK! That scene would have been just as acceptable if Sarek had used his interstellar katra-konnection power with Michael to set up a mental conference call between her, himself, and Amanda. And hey, since when was Spock the one who told Sarek to stay away? I always thought Sarek was the schmuck….or maybe they both were. Oh, well…just more canon fodder. My last big space/time credibility problem has been pointed out by many fans: why do the Section 31 ships all show up at the exact same instant??? If the United States suddenly needed all of our naval vessels in the Persian Gulf or the South China Sea, they wouldn’t all arrive simultaneously. Now, I realize that control is smart enough to want to deal a knockout blow with everything he/she/it has all at once, but those ships are still scattered across a very large amount of space. I just don’t think the writers get how vastly, hugely, mind-bogglingly big space is. There was banter—you know how much I love banter! Granted, the banter was primarily in just a few key scenes, but where it happened, it was a lot of fun. And at one point, we get all of the “comic relief” in one room: Tilly, Reno, Po, and Georgiou. The latter seems to now be giving a voice to all the viewers who roll their eyes at certain scenes. And to be honest, as that’s often me, as well, I’m fine being represented by a psychopathic Chinese woman dressed in black leather. And third, Stamets and Hugh did NOT get back together this episode. Hooray! Yeah, I know we’re all still rooting for them, and if it happens, it happens. But after last episode, I didn’t want Hugh going back to Paul for the wrong reasons. Now of course, it’s possible that the two star-crossed lovers will soon be permanently time-crossed, as well…more on that shortly. THE MANY, MANY, MANY GOOD-BYES! While some of the good-byes were done very nicely and added a nice, emotional impact to the episode, eventually I began to feel that there were just too darn many of them. Approximately 20% of the total episode screen time was dedicated to scenes involving good-byes! How many goodbyes were there? Let’s count…! Good-bye #1 – Pike has everyone on the bridge “eyes front” to salute Discovery before she self-destructs. Even though she doesn’t, it’s still a good-bye. Good-bye #3 – Tilly says good-bye to Po…except she’s not leaving! So maybe that’s an “aborted” good-bye. Good-bye #4 – A pissed-off Georgiou balls out Burnham…which is kinda like a good-bye. Good-bye #5 – Sarek and Amanda…very touching and well-acted scene. Okay, are we done yet? Good-bye #6 – Michael and Tilly say the “non-existent” good-bye because Tilly announces that the series regulars are staying with her on the ship because, well, that’s what friends do…and it’s either that or have season 3 feature only Michael Burnham as opposed to mostly Michael Burnham. Good-bye #7 – Tyler isn’t coming along, so he and Burnham get their heartfelt good-bye…except I felt mostly nothing because I never quite connected with them as a couple in the first place. And of course, Tyler needs to be available for the new Section 31 series. So while I wanted to get emotionally invested in this seventh good-bye, nothing came…not even with the sad, majestic farewell music playing. Good-byes #8, #9, #10, #11, #12 – Saru, Tilly, Owosekun, Detmer, and Stamets all get to record their good-byes into their iPhones for their loved ones…loved ones who, with the exception of Saru and Tilly, we’ve never seen or heard about before now. So no real emotional connection for me there, either. Okay, now we must be done with the good-byes, right? Good-bye #13 – Captain Pike says good-bye (individually by name) to each of the bridge officers. Good scene except that the writers punt on giving command to Saru. Why? Well, if season 3 really does have Discovery off in the distant future (or past or both) away from Starfleet, then the fact that there is no clear captain allows for some drama between Saru and Burnham when they don’t agree…assuming that’s what happens in season 3. Good-bye #14 – Now that Pike’s said his good-byes, the bridge crew gets to say theirs to him with heroic poses. And no one will miss that pepper-haired captain more than us fans! GIVE PIKE HIS OWN SERIES, CBS!!! SO, ARE THEY REALLY ALL GOING FORWARD TO THE FUTURE? To flee, or not to flee? That is the question! Or rather, to accompany or not to accompany? With all those good-byes this episode, it would seem like more of an anticlimax than a head-fake for the Discovery crew NOT to all wind up “out of time” (far future or distant past) going into season 3. After all, we’ve now separated all of the “main” characters (including a token alien) into a “core cast” for next season…which lowers the cost for extras, make-up, and uniforms. All we’ve gotta do now is somehow get Spock to stay in the present and for Dr. Culber to need to rush onto Discovery to save Stamets or something (unless Hugh is leaving the series…again). In other words, I don’t buy it. If flinging Discovery out of time is supposed to make all the continuity “reset,” it won’t…at least in my head. As for what’ll happen to the Discovery crew, well, one would hope that, if this idea works, then Starfleet will survive long into the future, just as it did in the previous Trek TV series. And so, a future Starfleet should welcome Discovery the same way we’d greet a time-displaced Leif Erickson or Magellan into the 21st century. Of course, we know from canon (if there is such a thing anymore! 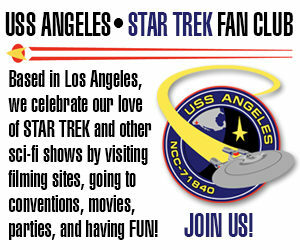 ), that Starfleet eventually builds timeships. So if the future really is what it used to be, then the displaced crew can be sent back to their proper time faster than you can say deus ex machina! Anyway, the best news is that all of our questions will (hopefully) be answered next week, and then I can finally get my Fridays back for the next nine months or so! 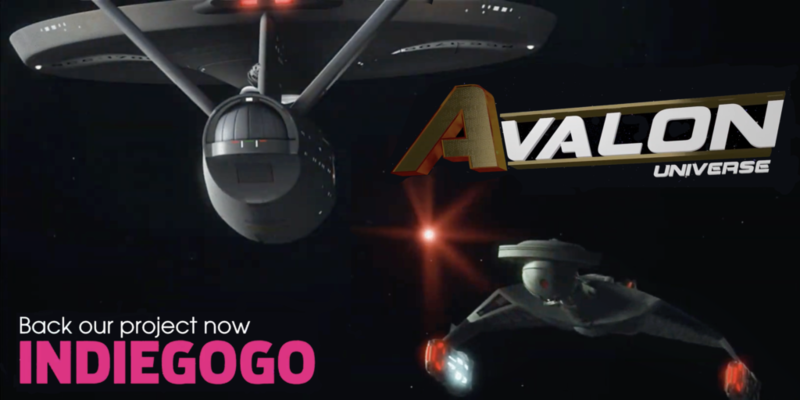 Can the Klingons help AVALON get $500 in donations in 4 days??? 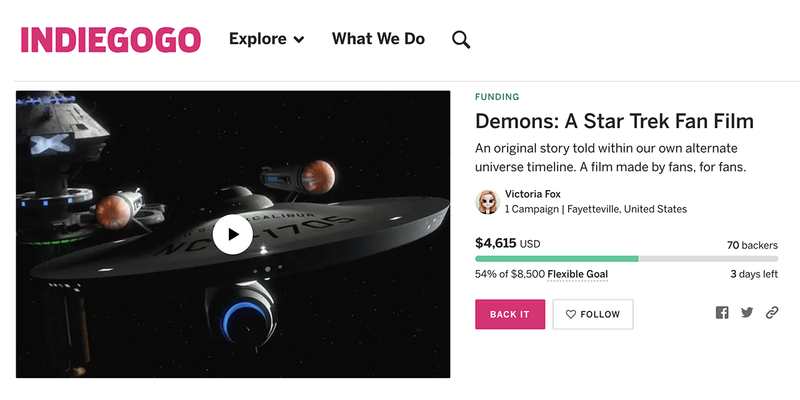 Currently, the Indiegogo campaign for the third AVALON UNIVERSE fan film, “Demons,” stands at $5,500 from 86 backers (64% of the way to their $8,500 goal). Actually, there’s an additional $500 donation that came in that didn’t get recorded (read more about that glitch here), so they’re really 70% of the way there! Last week, show-runners JOSHUA IRWIN and VICTORIA FOX extended their campaign for 8 more days, trying to attract a few extra dollars, if possible. So far, it’s worked to get them to where they are, but there’s still a way to go. It’d be great to reach their goal, but if that’s not possible by Monday, Josh and Victoria are hoping for at least another $500, which will make a really big difference for the production. So I’m doing my part in sharing the following three videos they’ve released showing the quality of the visual effects being done by the wizard of speed and time, SAMUEL COCKINGS. These are only pre-visualizations (rough animations to establish motion), but they show what some of the Klingon ships will look like in the Avalon Universe, which is similar to the prime universe but also slightly different in fun and fascinating ways. It gives the producers a bit more creative freedom than fan films that hew more closely to Trek canon usually get with ship and costume design. Author Jonathan LanePosted on April 12, 2019 April 12, 2019 Categories Crowd-Funding Blogs, Fan Film Features, NewsTags Crowd-funding campaign, Demons, Joshua Irwin, The Avalon Universe, Victoria Fox1 Comment on Can the Klingons help AVALON get $500 in donations in 4 days??? 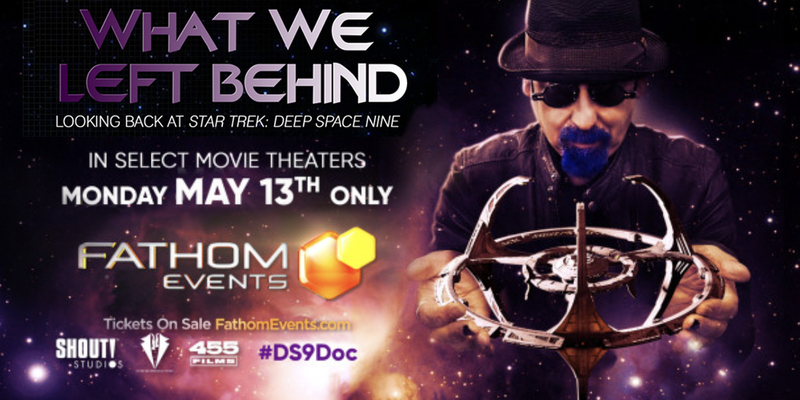 DS9’s WHAT WE LEFT BEHIND is finally COMPLETE – will debut exclusively to backers in April and in theaters for one day in May! It wasn’t even four weeks ago that I posted the HUGE news that the crowd-funded Deep Space Nine documentary WHAT WE LEFT BEHIND had been acquired by distributor SHOUT! STUDIOS. But now the news is even huger (yes, that’s a word!). Shout! Studios opened up a whole new realm of resources and opportunities for both completing the production as well as exposing more of the fan community (and general public) to this high-quality look back at the history of Star Trek: Deep Space Nine and into the minds and hearts of the people who made it all happen. The other major announcement(s) concerned when the completed documentary would be shown both to backers and to the general public. With Shout!‘s connections in theater distribution, in partnership with Fathom Events, What We Left Behind will be showing in over 800 theaters across the US for one screening on Monday, May 13th at 7:00pm. Fathom will be providing giveaway 11×17 posters at the door while supplies last, and this one-night event will include exclusive content with a new roundtable discussion following the film. You can order tickets here. Backers will still have many more chances to watch the documentary when they receive their DVD/Blu-ray combo sets. More details for backers (instructions for how to stream, planned shipping dates, etc.) will be coming soon. For now, the documentary team has just released this FANtastic new trailer. I challenge you not to tear up while you watch it (I got goosebumps)…! Author Jonathan LanePosted on April 9, 2019 April 9, 2019 Categories Fan Film Features, NewsTags Adam Nimoy, Ira Steven Behr, Star Trek: Deep Space Nine, What We Left Behind13 Comments on DS9’s WHAT WE LEFT BEHIND is finally COMPLETE – will debut exclusively to backers in April and in theaters for one day in May! WE HAVE SPAM, SPOILERS, EGGS, SPOILERS, BAKED BEANS, AND SPOILERS! 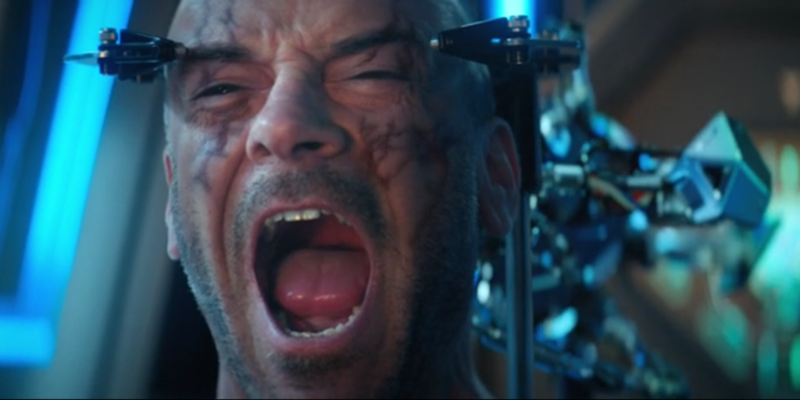 As I watched the 3-minute teaser and opening scene of act one of “Through the Valley of Shadows,” STAR TREK: DISCOVERY‘s twelfth episode of season two, I was dreading having to write another critical blog. It’s not that I have anything against (of for) being negative about Discovery; I just don’t like having to sit through weak or boring episodes that don’t live up to the potential of the series. We open on Michael Burnham (of course!) whose review of her mother’s time-logs is interrupted by a call from her adopted mother, Amanda Grayson. Yay, I thought! I love Mia Kirshner‘s portrayal of the character. But my hopes were quickly dashed as I saw Burnham yet again falling into self-pity and blaming herself for everything that goes wrong in the universe. Then it’s a cut to a briefing—again! What episode this season hasn’t kicked off with some kind of briefing? But at least this one wasn’t interrupted by Tillybabble. In fact, Mary Wiseman doesn’t appear in this episode at all (she wasn’t available the week of filming)…and to be honest, I didn’t really miss her. The episode felt more “grown up” without Tilly stealing her scenes. The briefing itself wasn’t bad, although every time I hear Tyler or another Klingon say “Kay-lesh” (Kahless), I cringe. Worf managed to get through two different Star Trek series pronouncing it “Kay-less”—is it really that hard for this show to be consistent with canon??? Then we come back from the opening credits with a scene between Burnham and Tyler that, as usual, showed almost no chemistry between the two actors and characters. Some quick exposition, a passive-aggressive zinger from Tyler, and then Tyler hears a beep that starts the real episode. Mysterious INDIEGOGO glitch almost cost the AVALON fan filmmakers a $500 donation! Currently, the total shows the campaign at $4,615 from 70 backers, about 54% of the way to their $8,500 goal. But as it turns out, there’s a $500 donation MISSING (more on that in a moment), meaning the total is really up to $5,115, or about 60% of the goal. 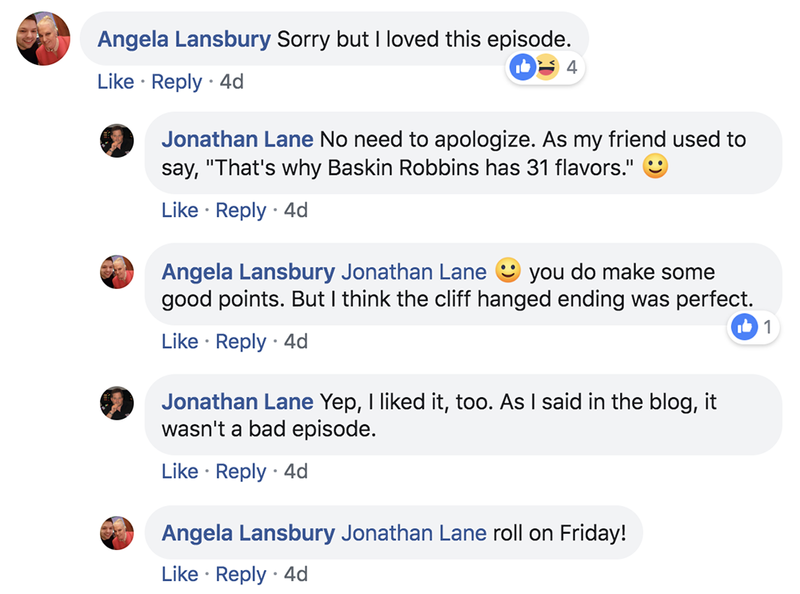 Author Jonathan LanePosted on April 5, 2019 April 5, 2019 Categories Crowd-Funding Blogs, Fan Film Features, NewsTags Crowd-funding campaign, Demons, Joshua Irwin, The Avalon Universe, Victoria Fox2 Comments on Mysterious INDIEGOGO glitch almost cost the AVALON fan filmmakers a $500 donation! Bad news turns into good news for STALLED TREK! By far, one of the funniest and most beloved of the fan-produced Star Trek parodies is STALLED TREK, the hilarious CGI-rendered puppet characters from the comedically brilliant mind of MARK LARGENT. Mark’s first Stalled Trek fan film “Amutt Time” was released in 2012 and followed the adventures of the crew of the USS Second Prize when its first officer, Mr Spott, began going through heat and needed to return to his home planet of Vulcanine to mate. It’s a MUST-SEE fan film. After doing this blog interview with Mark back in 2016, we collaborated on a parody of Prelude to Axanar, which was really a parody of the Axanar lawsuit. Called Prelude to Ax’d-We-Are, it featured the same puppet-style of characters and was just as funny as Mark’s first offering. 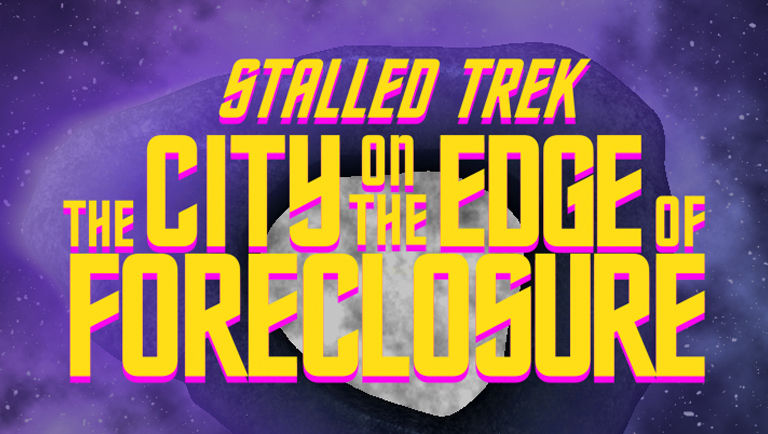 Then, last summer, Mark announced a new Stalled Trek: “The City of the Edge of Foreclosure.” This time, he would be returning to a parody of the TOS characters, and he successfully funded a Kickstarter with $4,181 (over an initial $600 goal) from 114 donors. It was time to start animating! Well, kinda. As Mark informed donors along the way, animation was a slow, tedious process, as he was rendering on a single Macintosh computer, using a 3D application called Animation:Master. Although it’s a great, affordable all-in-one app (according to Mark)—and he’d been using it reliably for the last 12 years—a single frame could take 3-5 minutes to complete. With 30-frames-per-second being the accepted norm, each second of Mark’s fan film could easily take 2 hours to render…or more ominously, each minute could take 120 hours of non-stop computer render time! And of course, a single glitch in the rendering of any scene would require starting all over from zero. This was why Mark told me that “The City on the Edge of Foreclosure” might be his last Stalled Trek. But to make matters worse, a few weeks ago, the makers of Animation:Master announced that their application would no longer be supporting the Macintosh platform…and Mark didn’t have the funds to buy a new PC with the power necessary to render frames of animation at any speed where he could realistically finish in months, possibly even years! Was this the end of the road for Stalled Trek??? Author Jonathan LanePosted on April 2, 2019 April 3, 2019 Categories Fan Film Features, NewsTags Mark Largent, Prelude to Ax'd-We-Are, Stalled Trek, The City on the Edge of Foreclosure3 Comments on Bad news turns into good news for STALLED TREK! SPOILERS – THEY’RE PART OF THIS COMPLETE BREAKFAST! Last week, I wrote what was only my second negative review for an episode of STAR TREK: DISCOVERY for season two. And the blog resulted in surprisingly passionate responses on Facebook, particularly in the “big” (107K member) Star Trek group and the (40K member) Star Trek: Discovery group. Some folks agreed with what I said. Others didn’t. But a disturbingly high number of posts were just plain mean and confrontational. All of this vitriol simply because someone has a different opinion from you??? When I was growing up, not everyone thought “The Doomsday Machine” was the best TOS episode like I did. But if someone thought “Spock’s Brain” was the best episode, I might quietly think they were weird, but I wouldn’t call them an “irrelevant shrub” (what odes that even mean???) or tell them to “PISS OFF” or suggest someone blow them out an airlock. It seems lately that Star Trek: Discovery (like so many things in this world) has polarized us. And for some people, any criticism of this show is seen as an “attack” that must be defended with a counter-attack. It’s ridiculous…and so discordant with everything Gene Roddenberry ever tried to teach us. The irony here is that I’ve actually written seven very positive reviews this season (you can read them here). I’m not a Discovery “hater” and happily praise the show when I think it’s been a decent episode. And when I don’t enjoy an episode, I share those thoughts, too. My opinion might not match yours, and that’s OKAY. We’re allowed to disagree. There’s nothing wrong with feeling strongly about Star Trek and Discovery. But I challenge anyone to defend being obnoxious to someone simply for writing a blog review that they didn’t like.